Using PC subwoofer design packages. Last week we covered the fundamentals of different sub box designs: sealed, ported, passive radiator and bandpass. Each has different characteristics in terms of the frequency response (the highest and lowest notes that can be reproduced), power handling, sensitivity (how loud the systems sound for a given input power) and how large the enclosure needs to be. The breakthrough came when two Australians - A.N.Thiele and Richard H. Small - realised that the behaviour of a speaker could be modelled in different enclosures if certain electrical and mechanical characteristics of the driver were known. These Thiele-Small characteristics, as they came to be known, are now available for all decent subwoofers. (If none of the following data is available, you immediately know that the driver isn't intended for any serious or semi-serious use!) Strictly speaking, not all of the following are Thiele-Small parameters - but because most software design programs need them, we've included them here as well. 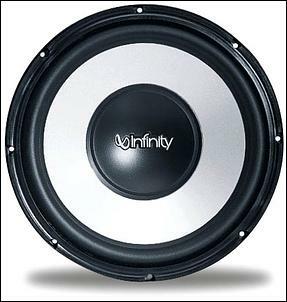 The amount of power being used to drive the speaker and its sensitivity and the sort of box it's mounted in will all determine the max sound pressure level. All three aspects are as important as the other - something almost always overlooked. 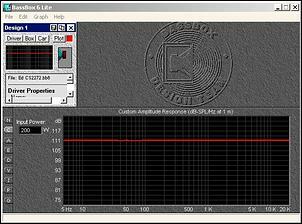 Speaker sensitivity is measured in dB at 1 watt/1 metre. In other words, it's how loud the speaker is when a microphone is placed a metre away from it and an input power of 1 watt is fed to the driver. Because the dB scale is used, small changes in this figure make a great deal of difference to how loud the speaker will be. For each 1 dB drop in speaker sensitivity, an amplifier 25 per cent more powerful will be needed to get the same SPL. Drop 3 dB in sensitivity and you'll need an amp twice as powerful if you want the same sound level. Building a sensitive sub is an easy way of saving on (expensive) amp power. 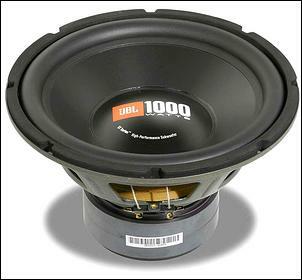 Sub sensitivities range from 85 to 102dB, and - as a rule of thumb - bigger drivers are more sensitive than smaller cones. But remember that the box design is also a vital input into how loud the finished design will be. In general terms, this is the lowest frequency at which the speaker's cone can effectively couple itself with the air - there's only so much that fancy box designs can do. 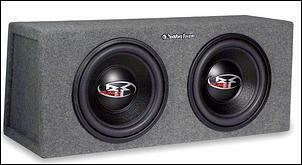 Subwoofers should have a resonant frequency of less than 50 Hz. The Vas figure is measured in either litres or cubic feet, and is an indirect measurement of how stiff the cone suspension is. The number actually indicates the volume of a closed box which would give the speaker the same stiffness as its suspension does. A high Vas number means that the cone is fairly stiff, while a low number shows that the cone is more floppy. Judging a 'good' or 'bad' Vas is not the idea - but it's important in enclosure design and so the figure needs to be available. In the same way that a car suspension needs to have its springs damped, so the moving mass of a speaker cone needs to be damped. 'Q' refers in fact to the opposite of damping - it's how much the resonance of the speaker is magnified. Qms refers to the control exerted by the speaker's mechanical suspension - the spider and roll surround. Qes refers to the control exerted by the driver's electrical system - the voice coil and magnet. Qts is the total Q and is derived from both the Qms and Qes. Again, judgement of 'good' or 'bad' Q figures is not the idea - but having available at least Qts is vital in doing the design. Xmax refers to the available travel of the cone, with the figure measured in one direction from the resting position. In other words, it's how far the cone can move before it hits the stops or the voice coil comes out of the core. A high Xmax figure means that the same size driver can move more air. Xmax can be measured in inches, cm or mm. In addition to the above specs, you'll also find other variables like Re, Mms, BL, Sd and so on. Basically, the more data like this that is available, the better. You don't have to have an in-depth knowledge of what each of these parameters means - but you do have to have enough of them to plug into the program. So you've found a driver that has available a whole heap of Thiele-Small parameters, you've got a good idea of the space available for the sub, and you want to jump right in on doing some virtual designs. Now what? 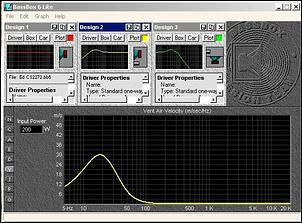 The next step is to find a subwoofer design software package. If you do a web search you'll find a variety of free programs, or you can shell out some cash and buy one. As you'd expect, the ones that you pay money for a helluva lot better than the freebies - better in terms of the data that can be generated, the different types of box designs that can be modelled, the 'help' support, and the accuracy of the results. 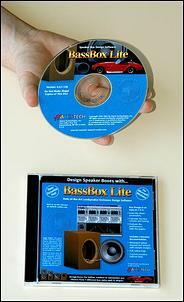 The software package that's used here as the example is BassBox, developed by US company Harris Technologies. In the 'Lite' version it's relatively cheap but can still do an excellent job. For beginners, one of the real virtues of BassBox is that the provided help files represent a complete course in subwoofer design. The notes are to the point and very clear. In fact, this material alone is worth probably half of the cost of the software package. The first step in the design process is to put enter as many parameters are available for the driver. 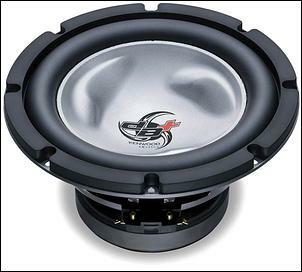 AutoSpeed staffer Ed had a request: a sub that would easily fit into the back of his Impreza WRX, use a Jaycar Electronics driver (Ed runs our shop which is a Jaycar agent...), have a response from 30-100Hz, and would be working with a 150W x 2 watt amp. The front-of-boot dimensions of the WRX are 96cm wide with a usable height of 41cm. Obviously the full depth of the boot (97cm) is available - but the request was to keep the enclosure as small as possible. Looking at those dimensions, a possible volume of 157 litres is easily available - that's a heap. However, we'd expect to be able to do something reasonable in a smaller volume than that. With that data entered, the first indication of the box type appears - a marker which is placed a little closer to 'closed box' than 'vented box' - indicating that this driver 'prefers' a sealed box design. However, this is not a hard and fast rule, and the fact that it's not right at one end of the continuum shows that there's some flexibility available. One button press later the sealed box volume is shown - just 31 litres when only small amounts of acrylic filling are used within the box! (And even smaller when the box is packed with acrylic filling, which oddly has the affect of increasing the apparent box size.) Another button press and the predicted in car response is shown - it's ruler flat. This means that the predicted SPL stays the same at all frequencies - there's no major drop-off in bass. Next up, what about a suggested ported box? This time the program suggests that for max bass a massive box - 124 litres in size - should be used with a port 105mm in internal diameter and 370mm long. And the response? Boom, boom! 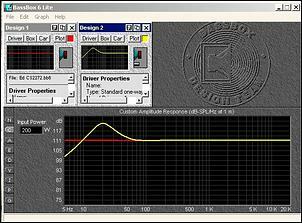 The yellow line shows that at just 20Hz there is a major increase in SPL - it's up to 122dB, compared with the 111dB of the sealed design (both with an input power of 200W). This probably over-kill, but at this stage we're just working with the program suggestions. By reducing the ported box volume to 55 litres and using a port which is 75mm in diameter and 270mm long, we can get the response shown by the yellow line. The red line (the sealed 31 litre box) has been kept on-screen as a comparison. The bass response of this modified ported design starts to rise smoothly from 100Hz and then peaks at 28Hz before smoothly dropping away again. That will give smooth but strong bass. Another thing to check with this design is that the cone won't reach its Xmax - that it won't be bouncing off the bump stops. This graph shows both the sealed enclosure (red) and the revised ported enclosure (yellow). The change in density of the yellow line indicates that with an input power of 200W, the driver's Xmax will be reached at 20Hz, a very low frequency. That's fine - if the figure had been 35Hz then there would have been real problems! A final check is that the speed of the air movement inside the port won't be so high that whistles or buzzes are generated. This graph shows that the max port speed will be 30 metres/sec - which again is fine. OK, so the 'winner' is the ported enclosure - so let's see if we can now get it down in size. Jaycar Electronics sell a 35-litre pre-built box suitable for a 12-inch driver; is it possible to use this? Well, yes and no. You can see here (yellow line) that when the vented box is dropped down in size to 35 litres the efficiency also goes down - it's now only a very small amount better than the sealed, 31-litre box (red line). Of course there are plenty of other options - probably an infinite number of combinations, in fact. However, this brief overview shows the basics of the design approach that can be followed. As you can see, the opportunities to tailor the result to your preferences, budget and build skills are almost limitless.